Which Dog Vaccinations Are Necessary? Only you and your dog’s vet can decide what vaccinations are necessary for your dog. 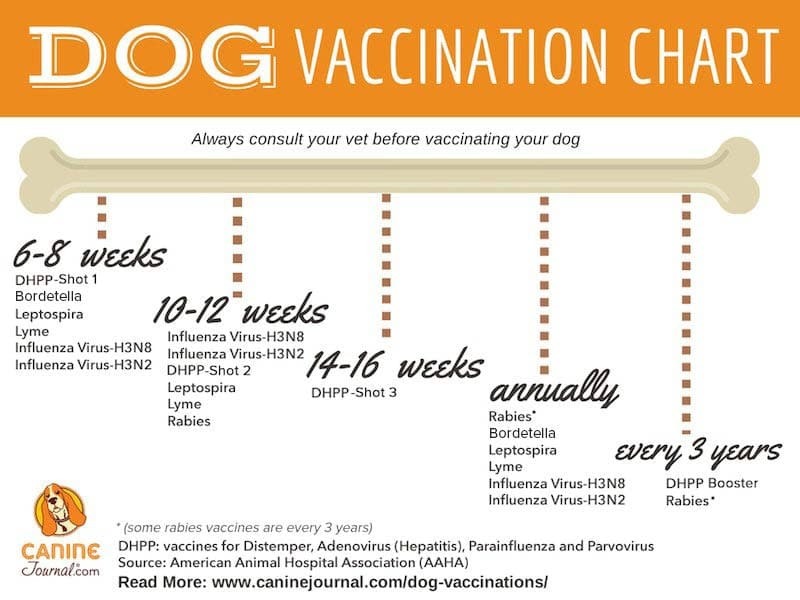 No one wants to put their dog through discomfort, and the vaccination schedule seems endless. You may question whether all of these vaccinations are really necessary. We’ll help you learn the core vaccinations and the non-core ones, but keep in mind depending on your area specific vaccination may be required. Vaccinations are designed to protect your dog against an array of illnesses. Vaccinations work by injecting your dog with a small amount of infectious organisms. The organisms are placed under your dog’s skin, and as your dog’s immune system recognizes them as foreign bodies, it begins to fight them. After being exposed to a specific infectious agent, your dog’s body will be able to identify these agents and release antibodies more quickly in the future. Many dog vaccinations that are “common” for pet owners to administer to their dogs, these include parvovirus, coronavirus, rabies, a 5-way vaccine, a 7-way vaccine, leptospira, Lyme disease, bordatella and parainfluenza. Canine parvovirus (parvo) is extremely contagious and is contracted through the feces of an infected dog. Unfortunately, parvo often kills young puppies with poorly developed immune systems. Around 91% of untreated parvo cases result in death. The parvo vaccine is the only way to prevent a dog from contracting this virus. Parvo cannot be spread from dogs to humans. Dogs that have contracted parvo generally show symptoms within three to ten days. The most commonly seen symptoms of parvo include: secondary infections, dehydration, lethargy, diarrhea, vomiting, endotoxemia, shock and eventually death. If a dog has a confirmed case of parvo they can infect neighborhood dogs with their feces and through soil that has come in contact with their feces. Dogs can still shed the parvovirus in their feces once they have recovered from the virus. The vaccine can take up to two weeks to take effect and fully protect a dog from it. The parvovirus vaccine is given as a 4- or 5-way vaccine (DHPP or DHLPP), standing for Distemper, Hepatitis (Adenovirus), Leptospira, Parainfluenza and Parvovirus. The first dose is administered as young as six weeks old and is then given in a 2 to 4-week interval until at least the age of 16 weeks old (totaling three times). A booster shot is given one year after the last interval dose, then again every three years. Coronavirus is a disease that affects the intestinal tract. Coronavirus usually doesn’t last too long, but it does cause numerous side effects and complications in some cases. Canine coronavirus can be passed through feces and saliva. A dog has one to five days after being exposed to the disease for symptoms to present themselves. Symptoms include onset diarrhea, a decrease in appetite and lethargy. A dog’s stool often contains mucus or blood and will always have a distinct odor. Unfortunately, there is no treatment for coronavirus. Do your best to keep control of the symptoms because often a secondary infection may occur, which you can then get antibiotics for. Coronavirus is rarely fatal except in the cases of dogs with underdeveloped or compromised immune systems. causes mild or subclinical disease. generally occurs in dogs younger than six weeks old. Rabies is a viral disease that can be carried by many mammals. This is one of the few zoonotic diseases (diseases humans can catch from their dogs). Rabies is commonly transmitted through a bite from the infected mammal. Rabies causes acute encephalitis and eventually infects the entire nervous system causing death. Rabies can be stopped if it is treated before symptoms occur. Once symptoms appear it becomes a fatal disease. Rabies can take anywhere from two to 12 weeks to present itself; however, some cases can take much longer. There are two forms of rabies: furious and paralytic. Once a dog is infected with rabies he will exhibit slight nervous systems abnormalities. A few days later the dog will either die immediately or progress to either the furious or paralytic stage of infection. A dog with furious rabies exhibits extreme behavioral changes. Furious rabies is often the type of rabies depicted in the media, the dog is aggressive and willing to attack. Dogs with paralytic rabies show a slow loss of coordination, weakness and then paralysis. If you ever think your dog has come in contact with rabies you should take him to the vet immediately even if he is up to date on his rabies vaccination. Symptoms of rabies include fever, paralysis, seizures, a dropped jaw, inability to swallow, hydrophobia, pica, a change in bark tone, unusual aggression, lack of coordination, excessive salivation or frothy saliva. Puppies 12 weeks old generally receive the rabies vaccine. However, this age may vary from place to place depending on local laws. The puppy gets a second rabies shot within one year after the first shot. After that, boosters are usually given once every one or three years, depending on the vaccination used and local laws. What Is the Adenovirus Cough And Hepatitis? The canine adenovirus type 1 causes canine hepatitis. Dogs who suffer from this virus experience swelling and cell damage in the liver, which can result in hemorrhage and death. This virus can be contracted through feces and urine of infected dogs. Symptoms include pain in the abdomen, abdominal distension, lack of appetite, pale color, lethargy, fever and tonsillitis. Fluid swelling in the corneas often results in the appearance of the dog having blue eyes. Death within one to two days is common in more severe cases. However, if a dog survives the first few days, it can result in a full recovery and future immunity to the virus. The canine adenovirus type 2 is a relative of the hepatitis virus and is one of the causes of kennel cough. Once your dog receives the vaccine for this virus, the severity of it is limited, so the chance of death is unlikely. Symptoms include the development of a hacking cough a week after exposure, inflammation in the airways, white foamy discharge after coughing, pink eye, inflamed nasal passages and nasal discharge. The canine adenovirus-1 or the canine adenovirus-2 injection will both protect against the adenovirus cough and hepatitis. However, the adenovirus-2 injection is much more preferred. This shot is usually included in a combination vaccine such as the 5-way vaccine or the 7-way vaccine. The canine adenovirus vaccine is normally given at 6 to 8 weeks old, 10 to 12 weeks old and again at 14 to 16 weeks old. Another is given with a combination booster shot 12 months after the last interval dose and then every three years. Canine distemper is an extremely contagious viral disease. This disease is closely related to the virus that causes measles. Canine distemper spreads through the airs and attacks the tonsils and lymph nodes. The virus replicates in the body and attacks the gastrointestinal, respiratory, urogenital and nervous systems. Unfortunately, there is no known cure for canine distemper; however, some dogs can recover fully after receiving treatment for symptoms and constant care. After a dog has fully recovered, she will no longer carry or spread the disease. Symptoms include high fever, runny nose, eye discharge, red eyes, lethargy, lack of appetite, coughing, vomiting, diarrhea, seizures and paralysis. Some dogs also experience thickening or enlargement of their footpads. The canine distemper vaccination is given as a part of a combination vaccination, most commonly the DHLPP. The “D” in DHLPP stands for distemper. This vaccination also protects against hepatitis (adenovirus), leptospirosis, parvo and parainfluenza, this is known as the 5-way vaccine. Dogs should receive a vaccination against canine distemper at 6 to 8 weeks, 10 to 12 weeks and 14 to 16 weeks. A booster shot is provided at 12 months and every three years after. Leptospirosis is a bacterial infection caused by the pathogen Leptospira. Leptospira, or Leptospirosis, can affect canines and humans and can result in death in some cases. Dogs become infected with Leptospires (an organism that thrives in water) by consuming urine contaminated water or contact with infected urine. Leptospires use a dog’s kidneys to breed and continue living out their life cycle. Symptoms include fever, vomiting, depression, loss of appetite, generalized pain and conjunctivitis. Later symptoms include: a drop in temperature, increased thirst, change in urine color, jaundice, frequent urination, dehydration, difficulty breathing, muscular tremors, vomiting and bloody feces. Antibiotics can help shorten the length of the disease and reduce potential organ damage if caught in early stages. In more severe cases, kidney filtration and blood transfusion may be necessary. About 10% of Leptospirosis cases result in death from secondary complications. 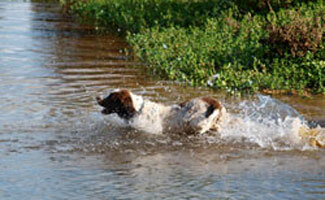 The Leptospirosis vaccination is considered a “non-core” vaccine and isn’t required. Leptospira is a preventative vaccination based on the two most common Leptospires known for causing this infection in dogs. Infection rates have dropped drastically over time and dogs that do become infected are by a completely different strain of Leptospire. Because of this, most vets do not regularly give the Leptospirosis vaccine unless there have been numerous cases in your area. The vaccine can be included in a combination vaccination like the DHLLP or it can be given individually. Lyme disease is spread through a tick bite. Symptoms don’t always appear for all dogs with Lyme disease although some will show swollen lymph nodes or lameness. If your dog does display symptoms of Lyme disease be sure to check her over for any ticks that may still be present. Untreated Lyme disease can cause extreme inflammation in your dog’s nervous system, heart and kidneys and potentially lead to death. Vets test for Lyme disease by taking blood samples and if a dog is positive for Lyme disease, early treatment with Doxycycline is prescribed. If a more advanced stage of Lyme disease is suspected antibiotic treatment will continue for longer and nonsteroidal anti-inflammatory drugs may be prescribed. The Lyme disease vaccination is usually only given to dogs in areas where Lyme disease is a concern. It is given as early as eight weeks old and a second dose is given two to four weeks later. A booster shot is given one year following the second dose and then annually. The best treatment is to prevent Lyme disease before it arrives by keeping your pet’s tick preventative treatmentcurrent. Bordatella, or kennel cough, is caused by bacteria and is spread through airborne contaminants. Bordatella is spread through exposure to infected dogs or the transfer of bacteria in food bowls, cages and water bowls. As bacteria multiply, it destroys the lining of the dog’s trachea, which results in a high pitch cough. Dogs may also gag and wretch as they cough. Symptoms include fever, sneezing, nasal discharge, loss of appetite and depression. Incubation for kennel cough is approximately five to seven days. When symptoms present, the dog should be given antibiotics and a cough suppressant. Untreated bordatella can lead to pneumonia and a secondary bacterial infection. The bordatella vaccination can be given as a traditional vaccination, as an inhaled nasal mist or orally. It takes 48 hours after the vaccination for a dog to develop immunity to the disease. Most kennels require dogs to have their bordatella vaccination before they allow boarding. Bordatella vaccinations are generally given once every 12 months. Parainfluenza, or canine influenza is highly contagious. Symptoms include dry cough, fever, wheezing, difficulty breathing, runny nose, sneezing, pneumonia, reduced appetite, lethargy, eye inflammation, runny eyes and conjunctivitis. Most dogs recover on their own, but most vets like to treat them immediately using antibiotics and antiviral drugs since it is so contagious. A cough suppressant and additional fluids may also be given to your dog. The parainfluenza vaccine won’t prevent the spread of the disease, but it will limit the severity of an infection. The vaccination is included in a combination vaccine called canine distemper-measles-parainfluenza shots and DHPP shots. The first vaccine is at 6 to 8 weeks old, the second at 10 to 12 weeks and again at 14 to 16 weeks old. A combination booster shot is administered 12 months after the last interval dose and then every three years. Non-core vaccinations are other canine vaccinations that are not mandatory except in areas where the specific illness or disease is rampant. An example is the canine parainfluenza vaccination. Many vets will still offer these non-core vaccinations in areas where they are not mandatory, but it is up to the vet and the pet owner to decide whether the dog in question is a suitable vaccination candidate. There are some items you may want to consider before allowing your vet to give your dog non-core vaccinations. Things like your dog’s age, size, breed, overall health and allergies are key factors. 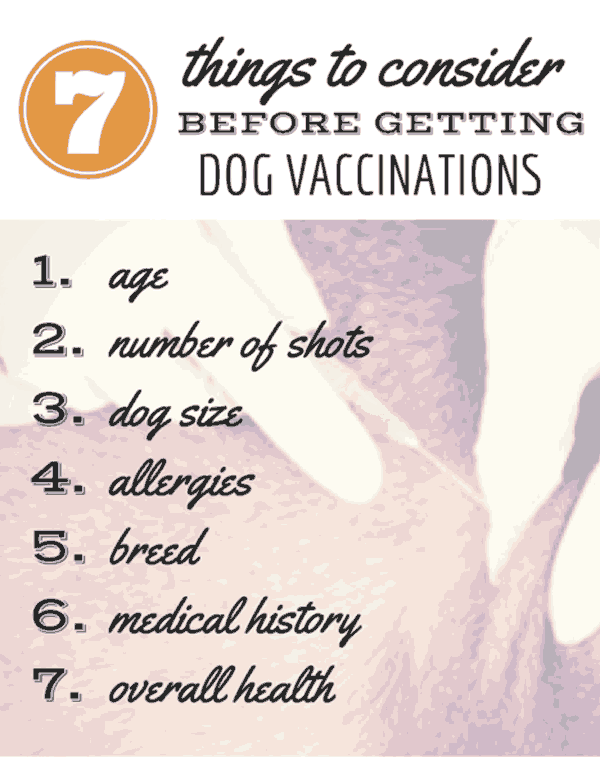 You also want to know your dog’s vaccination history and the other vaccinations your dog is receiving at that time. Vaccinations have minimum age requirements, and it’s important to stick to them. Young puppies do not have fully developed immune systems so shots of a live virus can affect her body drastically. There are also vaccines that cause side effects that young puppies struggle with. Elderly dogs often suffer from compromised immune systems so vets may be hesitant to give an unnecessary vaccine to him. There are times where a vet may recommend a longer period between non-core vaccinations for elderly dogs or they may even skip those vaccinations completely. 2. How Many Vaccinations Are Being Administered? Giving a dog too many vaccinations at once can increase the probability of side effects. This is why it’s important to space those vaccinations out. Your vet may wait to administer any non-core vaccines due to the other vaccines being given at that time. Some dogs may not weigh enough or be strong enough to handle a vaccination. This is another case where your vet may wait on administering any non-core vaccinations. This is especially true for dogs that are malnourished due to illness or runts of the litter. Dogs can be allergic to specific ingredients that can be found in vaccinations. If a vaccination contains an ingredient that your dog is allergic to your vet will skip this vaccine. Some dog breeds have sensitivities to elements that other breeds don’t have. Particular breeds may have a negative reaction to a specific ingredient while another breed struggles with another. One example of this is the German Shepherd, which has a sensitivity to Ivermectin in some cases. This is due to the presence of the MDR1 gene that is also seen in other herding dogs including Australian shepherd, border collie, collie, Australian shepherd mini, English shepherd, McNab, Shetland sheepdog, old English sheepdog and breeds that are mixed with these. The Longhaired Whippet and the Silken Windhound both have this gene as well. If a dog has had a negative effect from a previous vaccination, it’s important to note this so you are aware of what other vaccination may cause negative reactions. If this is the case, your vet may decide not to administer a non-core vaccination to your dog. You don’t want to vaccinate your dog when she’s ill. Vaccinations can put a strain on the body and the immune system. You also never want to vaccinate your dog when she is recovering from an illness, surgery or medical treatment unless it is necessary. As a dog owner, you’ll always wonder if a vaccination is truly necessary. You don’t want to put your dog through any unnecessary discomfort. Some say that vaccinations simply put your mind at ease while others believe you should protect your dog from everything harmful. There is no right or wrong answer. You have to do what’s best for your dog and only you know that. Consult your vet for advice if you find yourself overwhelmed. You and your vet should be able to make the appropriate decision for your dog to be happy and healthy. If cost is a factor for you, consider a wellness plan to help cover the expense of vaccinating your dog. No Replies to "Which Dog Vaccinations Are Necessary?" Copyright © 2016 - 2018 Pet Travel Questions.